In yesterday’s post, I shared the characteristics and practices of The Best Bosses I’ve Ever Had. Today I will reluctantly spend time reflecting on the worst ones of the bunch and what made them so. Of course, I won’t name names or give enough background to identify with certainty who I’m talking about. After 40 years of working, I’ve had many bosses across numerous roles at several companies and organizations. Heck, I’ve had ten bosses in ten years with my current employer even though I’ve only been in three roles and departments. Such is corporate life. I lost count long ago on how many I’ve had over time. So for those that know me, don’t miss the point of the article by trying to figure out who the “inspiration” for each item below may have been. It can be assumed that the flip side of the characteristics of my best bosses would make the list of my worst bosses, but I won’t be that easy on myself in writing this. Some of the items below are the opposites of the “Best Bosses” behaviors, but not all. I have a different set of people in mind for these points and their characteristics drive the items below. So let’s get to it. Constantly create or respond to one fire drill after another. This may show itself in unreasonable, last-minute demands of dropping everything and doing something entirely different “by the end of the day.” It may come as an emergency handed-down by my boss’s boss or someone else higher up, but that is no excuse for perpetuating the issue of allowing last-minute, random questions and events to determine what work gets done. Management that follows this pattern shows no sign of having, understanding, or following a cohesive strategy for accomplishing the business’s objectives. Life in such a business is one big ongoing game of Whack-a-Mole. Distrust their own people. Why would you hire someone you distrust? Why would you distrust someone you trusted enough to hire? Why would you continue to employ someone you distrust? It all makes no sense to me. This may be displayed by managers who refuse to delegate responsibilities and corresponding authority to their people to carry out needed tasks. It may be evidenced by physical signs of keeping employees away from anything of value. It may come via typical surveillance methods or asking others to spy on anyone suspected of wrongdoing. It may show in overzealous methods of required documentation or using technology to monitor nearly every minute or keystroke of an employee’s time on the clock. It may be evidenced by blocking common websites such as social media sites or shopping destinations. People who distrust never cease to amaze me at the creative ways they devise to try to justify their fears. Refuse to address personnel issues. This is maddening and kills the morale of the remainder of the team. Deal with issues fast, managers, or you may need to be dealt with next – either that or you’ll find yourself losing your good people because of your inability to solve the issues arising from your problem employees. And please don’t place the burden of dealing with problem employees on their peers. That isn’t what they are hired, paid or trained to do. Disrespect their people. This might be shown in a number of ways, from public condemnation and criticism to unreasonable time demands that encroach on their people’s personal lives, to speaking poorly of their people to others outside their department, to being offensive in word and deed through inappropriate language or physical behavior, or other ways imagined only by minds that I cannot understand. I could try to play psychologist here and claim that such behavior is a sign of low self-esteem – demeaning others to help one feel better about himself – but I’ll leave that analysis to others more qualified. Regardless of the reason behind the behavior, it’s wrong. Fail to lead. This can happen when someone is unqualified and ill-equipped for the role, unsure of what to do himself, and therefore unable to guide others. It can come from the wishful thinking that laissez-faire, hands-off leadership will magically bring out the best in others. It may come from those trying too hard to be friends with their subordinates. It may come from a boss who is already disengaged himself or who is in disagreement with those above him/her in the org chart. Businesses need people who know how to lead and who are not afraid to do so using sound principles of leadership – not dehumanizing, authoritarian abuses of power. Must have everything their way. Bosses must make the final call on some decisions, but to think that all or nearly all things must be done the manager’s way is surely the wrong approach. It discounts the knowledge, talents, ideas and innovations engaged employees can bring to the table. It stifles motivation and devalues the employees. Micromanage. Maybe some people need to be micromanaged, but I’m not one of them. Anyone who tries to do this to me is just annoying. I doubt I’m different than most employees in this regard. That said, I concede that short periods of keeping a closer-than-normal eye on an employee may be in order when poor performance is documented and greater accountability is in order. Still, it seems to me that if a boss spends all of his time peering over the shoulders of others to make sure they’re doing things a certain way, then that boss may not be necessary to the business. Try to keep employees from advancing. One of the potential downfalls of doing one’s job really well is that it can sometimes result in employers keeping you in that role even when you want to grow, learn, and experience other roles, be they lateral or vertical changes. A boss who is concerned with the professional development of employees will go out of his way to encourage such growth and experiences. Think of it, bosses, as your opportunity to make a positive impact on the lives, careers, and even the families of many people over time – a far greater contribution to the world in the long run that pigeonholing people into roles they are ready to leave. If you try to “keep them in their place” too long, they may just leave the company for greener pastures, and then you’ve just blown it for the company permanently. Are rarely available to their employees. Too many companies end up filling the daily calendar of bosses with back-to-back meetings all day every day. Not only does this likely keep the boss from doing much that’s actually productive, but it keeps him/her from being available to the very people most likely to want and need his/her presence periodically throughout the day. Temporarily removing oneself from the area or occasionally closing an office door to focus on a task is understandable and reasonable, but rarely being around or always being behind an uninviting closed door creates an unhealthy barrier between bosses and their people. Discourage employee engagement. What I’m thinking of here is when a boss thinks that only he/she can do some things, failing to delegate in the best interests of the business. The idea that only people at a certain level should make decisions or do certain things creates an “us vs. them” mentality rather than a team approach. I’ve witnessed this in businesses and volunteer organizations where, oddly, volunteer engagement is discouraged in favor of staff-only decision making and execution. Withhold vital information from employees. There are times when company leadership determines that certain information about the business must remain hidden until some specified time at which it is unveiled. That’s understandable, especially for a publicly-traded business that must follow strict laws. However, there are times when bosses at their own discretion choose to hide from employees information that the employees may deem very important to their work or career decisions. Consideration for the employees should take precedence in such situations. Make you dread going to work. When your thoughts during your morning shower start the day by dreading going in to work, imagining the potential conflict or irritants awaiting, you know you’ve reached a point where either a major change in the relationship needs to happen, or it’s time to move to a different position. On the contrary, working for a great boss makes it a pleasure to be there today and for the foreseeable future. If your non-work time is starting to be filled with negative thoughts, hindering your personal life as well, it’s time for change. Overall, I have been fortunate with more jobs than not in the kinds of bosses I’ve had for the past 40 years. There have been scenarios, however, where I have painfully been reminded by experience of the common maxim that people go to a new job because of the work, but they leave a job because of the management. That is true all too often. Sadly, the very managers most guilty of the negative behaviors and characteristics mentioned above are also the most clueless about their behavior, its negative impact on people and, ultimately, the impact on the businesses they are employed to serve. For bosses reading this, I encourage you to look over these traits and the ones listed in yesterday’s post about my best bosses. Do an honest self-evaluation. Give yourself kudos for the positive qualities you think you regularly demonstrate. Make note of the negative ones where you should improve. If you’re really brave, initiate some 360-degree feedback from subordinates, peers and supervisors for a more complete analysis. Then pick one or two areas for improvement and make a plan to improve. Grab an accountability partner to help you in the cause. Don’t focus only on your weaknesses; that’s unnecessary and depressing. Acknowledge and celebrate your strengths. Do this kind of evaluation at least annually and, if you’re in a better place a year from now, you’re doing well. Keep it up. For employees reading this, especially if you see more negative than positive qualities in your current boss, you have some decisions to make. Do you stick it out with a poor boss in order to keep doing work you love, to keep working with great coworkers, or to maintain other benefits of the role? Do you risk addressing the most important issues with the boss, unsure of what his/her reaction may be? Do you chance the nuclear option of attempting to go over the boss’s head to his/her supervisor with your concerns? (Be very careful about doing that.) You have to make those calls yourself. I default to the approach of privately addressing the issue with the boss as the most direct and proper method, even if it does have potential negative consequences. Maybe you have other characteristics you’ve experienced in your worst bosses. If you have some to add to my list above, feel free to do so in a comment. I’d love to hear about them. Here’s hoping for a brighter future with great bosses! I got my first job at age 16. I was a clerk at a locally-owned grocery store in my hometown of Winchester, Kentucky, happy with the $1.60 per hour starting salary. I did my work to the best of my ability. I was thrilled when I got my first raise of five cents per hour. I got along with the owners and the extended family that ran the store. They were each different with their own personalities and ways of doing things. In that environment, I got my first taste of the differences that bosses can bring to the workplace. That was 40 years ago. Over four decades of working, I’ve had experience with a lot of different bosses – some great, some mediocre, some awful. In this post, I will share with you the characteristics and practices demonstrated by the bosses I consider to be the best that I’ve had the privilege to work with. My next post will discuss the flip side – those dreadful characteristics and practices that have made working under some bosses a painful time of endurance testing. Are encouragers. We like to be encouraged with kind words and with recognition of a job well done. We like to know that others have confidence in us even if we aren’t quite as confident in ourselves at times, especially when tackling something new. If you tell me you know I can do something, I will do everything in my power not to let you down. Are approachable. Whether via an open door policy or by ample other opportunities to engage with employees, bosses must create an environment where their direct reports know that they are welcome and encouraged to approach them any time with questions, concerns, suggestions, complaints, etc. An unapproachable boss will be detached from the team and woefully unaware of the reality around him/her. Are organized. A boss who knows how to set priorities, plan and successfully execute sets a great example for those who report to him/her. On the contrary, unorganized bosses can leave a whole team disorganized and discouraged by the constant chaos. Are willing to do grunt work if needed. I appreciate bosses who don’t mind getting their hands dirty, digging in when necessary to help the team churn out what needs to be done. This can’t be the primary role of a boss, of course, but in those times when extreme work loads or looming deadlines tax the ability of others to get it all done, this is a great gesture of teamwork that goes a long way in developing good will. Give me a job to do and turn me loose to do it. I work best when I’m left alone to get things done without anyone peering over my shoulder or constantly checking up on how things are going. If I need help or hit a roadblock that will take a boss to overcome, I’ll let the boss know. Until then, he/she can assume all is well and on schedule – maybe even ahead of schedule and expectations. Help me understand the big picture. I don’t want to just know how to do tasks A, B,and C. I want to know how the work I do fits into the overall purpose of the company and its larger mission. I don’t want to just be good at tactics; I want to understand strategy. I am helped by having core values that underlie the business reinforced in word and deed by people at all levels of the org chart. I want a leader who can help a team take a step back when needed and help us remember why we do what we do. Exercise fairness in how each employee is treated. Any hint of favoritism from a boss toward one employee over another creates a very dysfunctional team. If some employees seem to get away with poor work performance, excessive absences, or inappropriate behavior that is not tolerated in others, fellow workers are potentially demotivated from doing their best because of the disparity. I don’t expect better treatment than other employees, but I do at least expect equal treatment. Address personnel issues quickly. This may be with an under-performing employee or it may mean stepping in to mediate interpersonal tensions between two or more employees. Regardless, issues cannot fester or they do more damage the longer they are ignored. Dealing with conflict or difficult situations must surely be among the least favorite roles a boss has to play, but it is an essential one that pays big dividends in the long run. Tangibly reward top performers. While recognition and encouragement go a long way toward job satisfaction, it is also true that none of us are employed full-time merely for the fun of it or the kind words that may come our way. We work to earn a living, and if we go above and beyond what is expected, then we should be compensated accordingly. Any business that places arbitrary limits on how much people can earn in certain roles or who do not allocate funds for increased salaries and bonuses only demotivate employees who feel like they have maxed out their earning and growth potential in a role. Expect accountability. My first boss at my current employer ten years ago was as good at this as any I’ve ever had. Like clockwork, we had one-on-ones with a common, simple agenda that showed what we had accomplished since the last meeting, what we would do before the next one, and any issues standing in the way that we might need her to run interference regarding. There’s something about knowing that periodic check-in with the boss is coming up to sometimes light a fire under you to get things done. Do what they say they’ll do. Just as I expect to be accountable to my boss, I expect my bosses to follow through and do what they say they’ll do without needing frequent reminders from others. I know schedules can be crazy and demands from above and below in the org chart can be hard to juggle, but failing to follow through on commitments is discouraging to those impacted. Challenge me to do better. Regardless of how well I may perform my duties, I know there is always room for improvement. When I was a training manager for about two dozen trainers at a previous company, I took seriously sitting in on the classes they taught and meeting with them afterward to discuss what they did well and what they might work to improve. If someone comes to me and praises me for how I do A, B, and C, but suggests that I might consider some suggested changes to improve how I do D, E, and F, I’m going to value that information and take it to heart, trying to improve in those areas. Welcome innovation and initiative. I can’t think of a job I’ve had in 40 years where I did not go above and beyond what was expected, voluntarily taking on new responsibilities and attempting new things that I thought would be beneficial to the business and/or its customers. That doesn’t mean that I was in a role where such was expected or demanded, however. Good ideas can come from any level of the org chart at any time. Good bosses hear those ideas, weigh them, give guidance, and, where appropriate, approval. Delegate authority – not just responsibility. There is not much more frustrating in a role than having responsibilities without the accompanying authority. The power to make decisions and implement them needs to be pushed as far down the org chart as possible instead of being concentrated up the chain. Work gets done more effectively and efficiently when this is the case. Have my back. Nobody likes being thrown under the bus by anyone, but especially by your boss. I appreciate bosses who have gone to bat for me, defending decisions made and actions taken when challenged by others. It’s like having an older sibling step up to a playground bully and say, “If you want to get to him, you’ll have to go through me first.” Of course, it won’t be in those exact words in a business conversation or email (although that would be awesome! ), but the positive emotional impact is the same when a boss takes up for you in discussion with others. Show a sense of humor. Humor goes such a long way in strengthening relationships, in making an environment fun, and in showing someone’s personal, human side. Work days can get long and stress can take its toll, but if days are broken up with regular moments of laughter and fun, it makes them seem shorter and the stress more bearable. So, there you have a number of characteristics or practices that I consider to be among the most admirable I’ve seen in the best bosses I’ve had through the years. What about you? Which of the above resonates with your experience? Do you have additional ones from your work life you could add to the list? If so, let me know in a comment. Having lived by the framework for 2012, I decided that it fits me really well and that there is no need to be creative or different and come up with a new set of words for 2013. 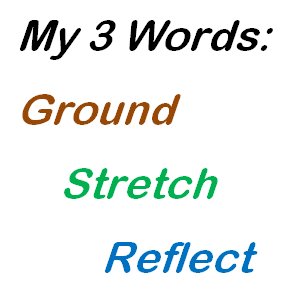 So I share with you again my three words, this time with a year’s experience behind the framework. The Ground word means that I will spend time daily grounding myself in that which is most important and foundational to me. Since that is my Christian faith, it requires me to spend time in basic Christian disciplines such as Bible study, memorization, and prayer. Ideally, I would get up early and do this before the rest of my day, but the truth is that I’ve always been more of a night person than a morning person, so it’s just easier for me to take some evening time to do this. My periodic attempts to set the alarm back an hour just don’t seem to last for too many weeks. The danger in waiting until evening is that I get involved with other things and don’t get it done. If it’s important to me, though, I will find the time. Stretch means that I will try to excel at what I do throughout the day – not just get by with the minimum expectations that others may have for me or that I may have for myself. If I have talents and passions, they ought to be stretched to the max – no excuses – be they work related or personal endeavors. To Reflect means that I will also take time at the end of each day to ponder what has happened and try to make sense of it all. It meant last year that I wrote a daily lesson learned, and I will continue that in many of my every-other-day blog posts here for 2013. But even on days when I don’t write about it, I need to do it. Asking questions like the following helps: What happened today that taught me something? What did I do well that I’m proud of? What did I drop the ball on? Did I make a positive difference in someone else’s life today? Did I treat others around me the way I want them to treat me? Was I someone to whom my Lord would say “Well done, my good and faithful servant”? The framework of Ground, Stretch, Reflect works for me, so I’m staying with it. Do you have such a framework yourself? If so, what is it? If not, think about it. “Am I in Louisville?” That was the surprising question I was asked tonight by some random guy driving by in a pickup truck while I was out walking my dog. He stopped near me, called me over and asked the question. “Yes,” I answered. Then he asked me how to get to the Greyhound bus station. I gave him quick instructions that would get him in the general direction about seven miles away where he could then ask someone there for final directions. As he pulled away, I had to chuckle. I’ve lived here since 1985 and I don’t think anyone sober or drunk has ever asked me “Am I in Louisville?” I resisted the urge to mess with his mind and say something like “Dude, you’re in Ohio.” About a minute later the guy turned his truck around to head the direction I indicated, but had to stop again as he got up to me to verify the instructions I had just given him. Who knows if he ever made it? I wouldn’t put money on it. The lesson that came immediately to mind is leap year lesson #217 – To reach your destination, know your starting point. Thanks to a holiday week with far fewer interruptions and meetings than normal, I got completely caught up in my email inbox at work and home today. What a wonderful, rare moment when I realized that I had no emails waiting on me in either place! Aaaahhhhhhh……… the bliss! Of course, that just meant that I was then free to actually get some other things done on my to-do list, but that’s OK. That’s what I was hired to do in the first place. Over time, it’s interesting how little tasks and responsibilities continue to add up until you hardly even recognize your real day-to-day compared to what you think it should be. For example, as the community manager for our internal social network, I want to help plow new ground in how our communication platform is used and in the amount of use by senior leaders (who definitely are not leading in this regard). I want additional mobile versions of the platform approved and available. The masses need some basic education about how to use it. There are new capabilities in the software that people need to know about and shown how to use in order to help them do their work more effectively, efficiently and collaboratively. However, regardless of the number of big-picture initiatives I would prefer to spend time on, there is always an endless supply of little requests coming from here and there via email, phone calls, instant messages, hallway conversations, and via the platform itself. So what do I do? How do I balance making progress in big, long-term advancements while keeping up with the routine daily maintenance activities that will always be there? For the past five weeks, my answer has been to carve out my mornings for the larger initiatives and then spend the rest of the day on the miscellaneous. So far, that has worked well. I can honestly say I’ve accomplished more in the past five weeks towards major initiatives than in the previous several months combined. So the mornings will continue to be protected on my calendar for the foreseeable future. Leap year lesson #186 is Find what works for you and run with it.